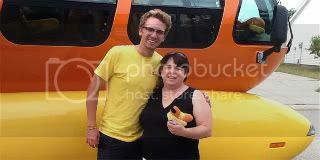 The e-mail came from Dyl-icious Dylan, asking if I wanted to hop aboard the Oscar Mayer Wienermobile and show him around Indianapolis. Frankly, he didn't have to ask me twice! I told him I would relish the opportunity. Dylan and his partner, Ketchup Kylie, are in Indy for the week and had some down time. They were looking for someone to introduce them a bit to the city. So Dylan googled "Indianapolis bloggers" and came up with me. Hot diggity dog! It turns out that Kylie was feeling a little under the bun, so Dylan pulled up to my house by himself. There is nothing quite like seeing the Wienermobile driving down your street. 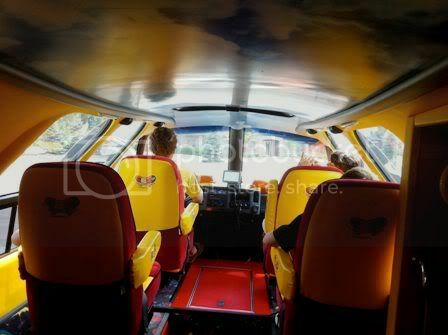 The boys wasted no time running out of the house and taking their seats in the hot dog on wheels. I'm just glad Clifford the big red dog wasn't around to chase down this treat. Dylan, being a very conscientious Hot Dogger, insisted everyone buckle their "meatbelts" before we headed out. I decided to ride "shotbun" so I could help Dylan navigate our way to our first stop. We headed to a nearby shopping center where Annie and about 29 other teenagers were due to return from a day of service at a camp for kids with disabilities. You should have seen how excited these kids were to see the Wienermobile, get Wiener Whistles and stickers that said "I saw it!" 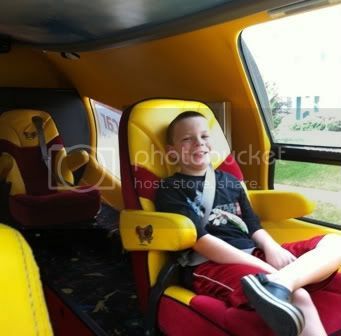 I'm afraid, for these kids, any other surprise just won't cut the mustard after they've experienced the Wienermobile. And it wasn't just the service day kids. 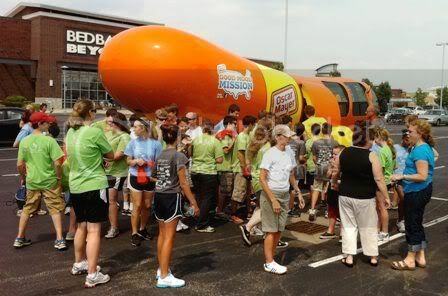 People came out of stores, pulled up in their cars, and followed us into the parking lot just to get close to the legendary Wienermobile (which is actually one of 6 Wienermobiles on the road around the country). We had so much fun spreading hot dog smiles that we decided to take the smiles across town to our friends at Joy's House, an adult day community. 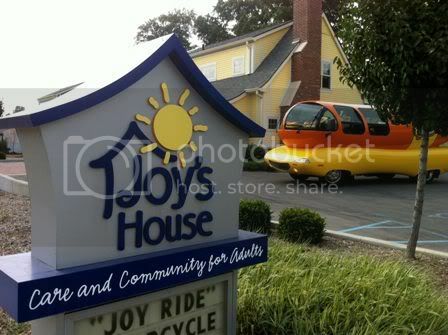 For security reasons, the guests at Joy's House couldn't come outside to visit the Wienermobile. Instead, Dylan pulled up along the dining room windows, so the guests could relish the view from there. Then we all got out and went inside to visit with the guests and hand out Wiener Whistles and I saw it! stickers. Laura & Tina at Joy's House -- What you might not be able to tell from this picture is that Tina was about to strangle Robbie if he blew his Wiener Whistle one more time. 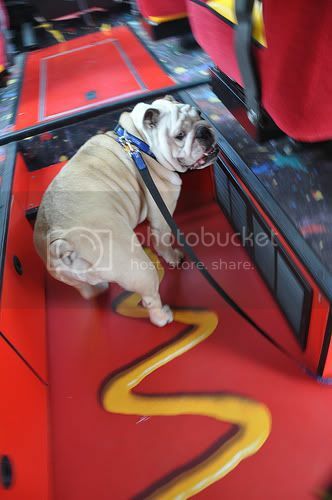 Once she took the shotbun seat, we weren't sure if we were going to be able to get Tina out of the Wienermobile. 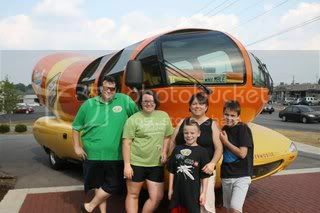 And despite the fact that the heat was beginning to ketchup with Robbie, we piled out of the HDOW (hot dog on wheels) to pose for a family picture. I'm pretty sure I'm going to send this one out in our Christmas cards. By the time we were wrapping things up at Joy's House, we were getting pretty hungry. 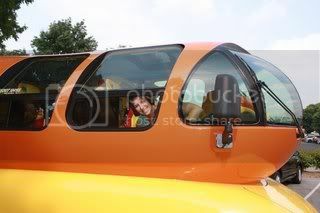 Despite the fact that you're driving around in a giant hot dog -- did you know the Wienermobile is 60 hot dogs long and 24 hot dogs high? 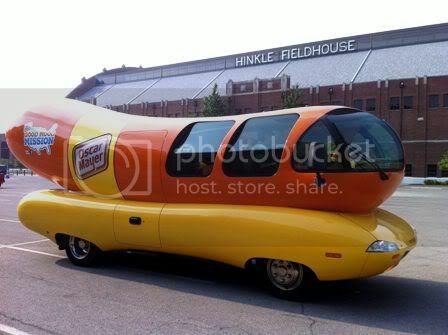 -- there's actually nothing to eat on the Wienermobile. 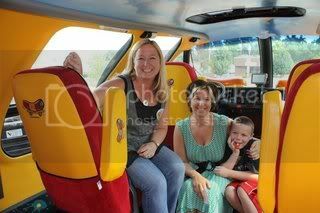 So, where do you take the Hot Dogger who is graciously driving you around town in a grilled fiberglass hotdog? To a hamburger joint, of course! 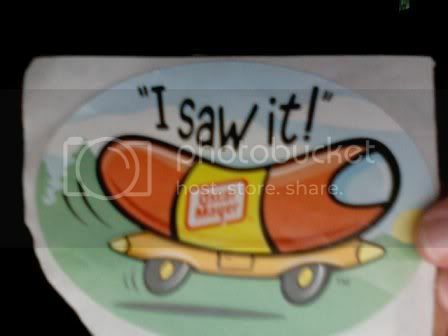 Just as we were getting ready to leave Butler, there was a knock on the side of the Wienermobile, which Dylan said is a pretty common occurrence. What was uncommon about this knock, however, was it came from the father of Butler Blue 2. They (Blue 2 and his pop) had been following our tweets and knew we were on campus. 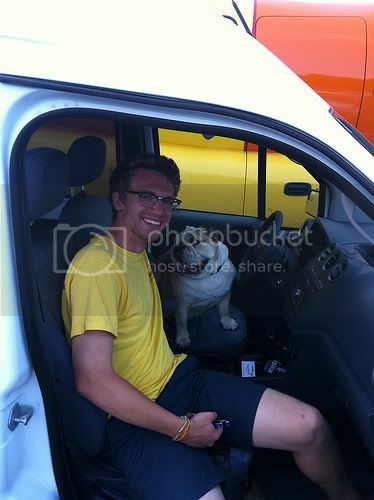 So we introduced Butler's hot dog to Dylan and the Wienermobile. Even our seasoned Hot Dogger was impressed. 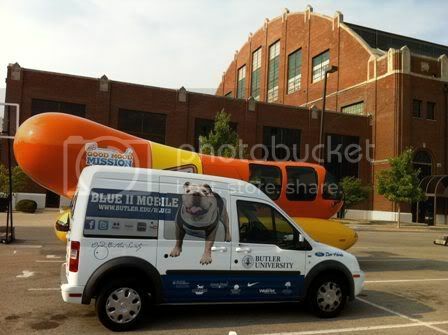 First Blue 2 checked out the Wienermobile -- that's just mustard. Blue 2 was perfectly behaved. Then Dylan tried out the Blue 2 mobile. It was a mutual admiration society. By that time, we were all getting pretty tired. So we rolled on home and said goodbye to Dylan and the wiener on wheels. But before he drove away, Dylan left me with my very own beanie weenie -- a stuffed Wienermobile! 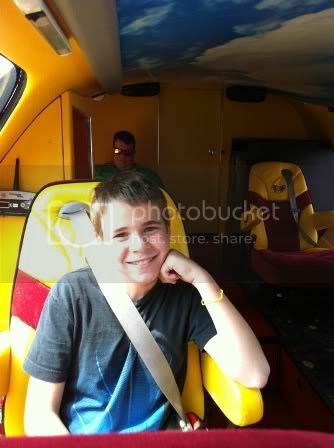 Stay tuned for an exclusive interview with Dyl-icious Dylan, the Hot Dogger and Wienermobile driver. Woo Hoo.....What a fun time! What a fun day! And other than your camera or camera-phone, there were no electronic games, video games, or TV's yet it looks like the kids had a ball. Bet this will make the "what did you do over summer vacation?" list when they get back to school. Speaking of TV, were there any TV cameras rolling? I did see it once in our town, years ago. Being able to ride around in it for the day is very cool. Mustard been fun. How fun! Great post - love the bun on words! This looks like such a great time! I have to say, if Dylicious Dylan emailed me asking me to ride his weiner, I'm not sure how I'd respond. Just how dumb do they think we are?